Baby Polo Top to fit age 3 months. A vintage style sweater with up to the minute detail. 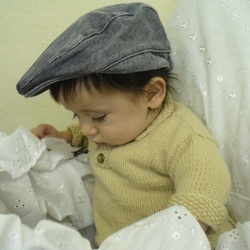 This classic sweater is worked in stocking stitch with moss stitch trims. The sleeve bands are left open to allow for optional turn back cuffs and two vintage buttons complete the look. 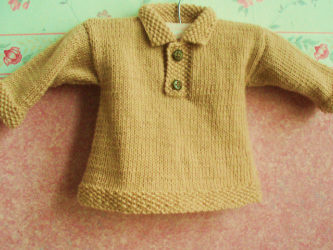 The garment is suitable for a beginner who is capable of knit and purl stitches as well as increasing as decreasing. It is made up of four basic shapes, the button bands are knitted at the same time as the front and the collar attached later. Detailed instructions are included with photographs explaining any new techniques. An exclusive Careloom designer pattern with clear instructions. Organza bag to hold your knitting on the go. Available in a choice of four soft vintage colours.